Where can we expect to meet seahorses in France and Europe? The answer is quite simple: mostly where we never go! These animals are to be found neither on beautiful sea fan walls, nor on deep wrecks. If one wants to see seahorses in France, there are a few renowned places: Arcachon Bay and Hossegor Lake for the Atlantic, and Thau lagoon for the Mediterranean. But outside these lagoonal area with quite specific environmental conditions, they can also be met more or less incidentally all along European and Mediterranean coasts. 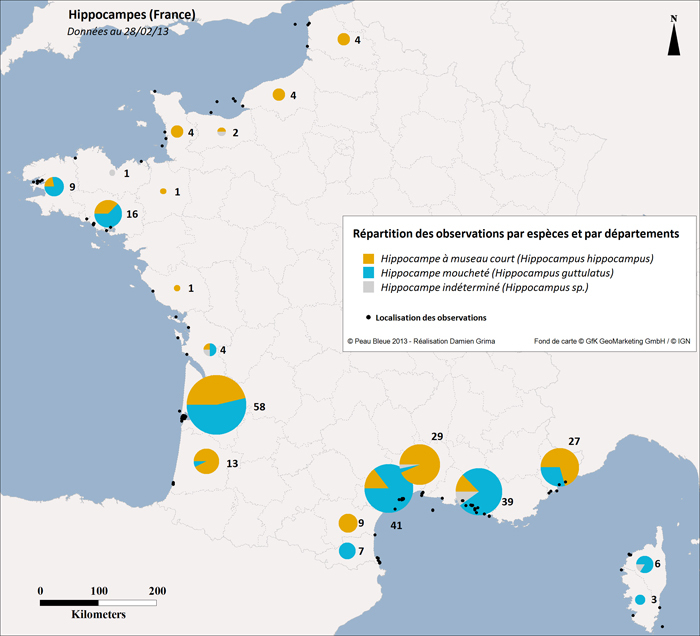 The map below summarizes the Hippo-ATLAS records gathered for French coasts up to the end of February 2013. And of course, if you have seen a seahorse or a pipefish in an unregistered location, don't hesitate: send us the information!